WHY THE REEF CLEAN TEAM? 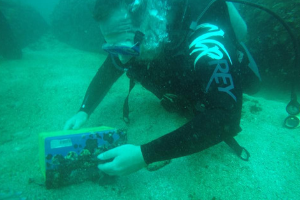 The key objective of the Reef Clean Team is to create awareness, understanding and appreciation for the Reef and connected ecosystems. This creates a community culture towards Reef protection and provides an opportunity for everyone to work together to help protect the reef. 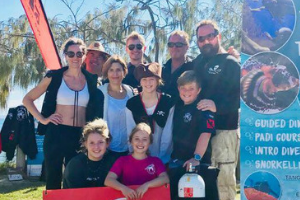 Reef Clean Team is a not for profit organisation designed to empower everyone, particularly our younger generation, to make a positive difference to the environment by participating in the removal of marine debris from the reef, ocean and beaches. Protecting and preserving the Reef for the benefit of the world community and future generations requires teamwork, partnerships and collaboration. Reef Clean Team Sunshine Coast regularly goes out diving and cleans up debris and rubbish from the beautiful reefs of the Sunshine Coast. This includes building rubbish, fishing line, bottles, anchors & more. 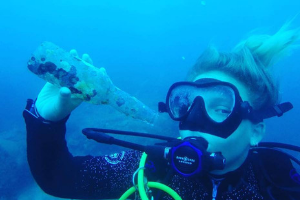 You would be surprised at the amount of rubbish collected on each dive. No experience is necessary, you can learn all you need to know at one of our Reef Clean Team Pool Sessions. Come and join Sam Coward, Pirate Poppy, Diver Declan and Aqua Lexi in keeping our reefs beautiful. Reef Clean Team membership includes a club t shirt, hat and benefits such as members only dive days, discounted dives & more!